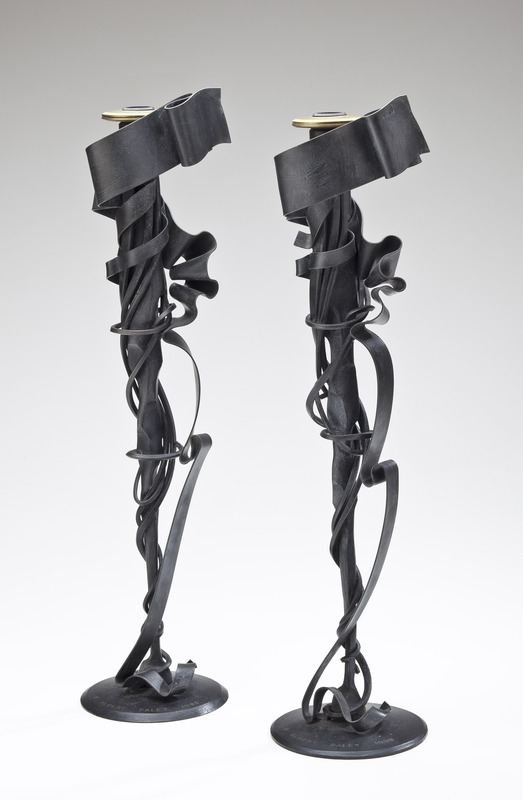 A pair of wrought iron candlesticks by American sculptor Albert Paley (b 1944). The shaped stem tapers to the foot and is wrapped with scrolling strap and rod work, which highlights Paley's Art Nouveau influences, particularly that of Hector Guimand the designer of the Paris metro entrances. Nevertheless, Paley adds his own vigorous aesthetic to these candlesticks which are accented by a black patina. Each stick comes with its own removable double brass bobeche that is raised on the shaped stem. Signed Albert Paley and dated 1998 on each base.